A monochrome photograph of a school group annotated at the top '1924' with names on the reverse; back row G Mackay, D Murray, W Sutherland, L McBeath, G Hendry, Matheson, J Kennedy, E Sutherland, G Mackay - middle row: Jean Munro, Matheson, M Mckay, N Murray, B MacLean, C Hendry, Kate Taylor , MacLean, ? , - front row; Tom Mcbeath, McLennon, W Matheson, E McBeath, Allan Murray, ? . B McKay, Geo Kennedy. 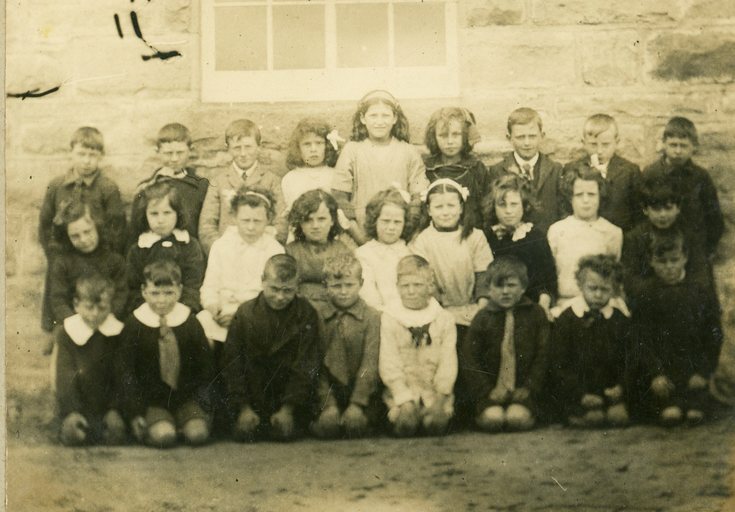 Those not identified have an annotated X to the right at the end of middle row and below the third child from the right in the front row.